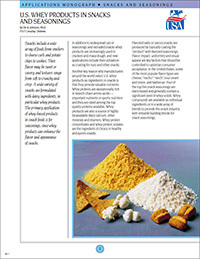 An 8-page monograph discussing the use of U.S. whey ingredients in snack manufacture. Reviews the function of whey products in snacks and in cheese blend seasonings; the process of applying seasonings to snack foods; and the benefits of whey products in snacks applications. Also includes a Q&A section. Also available for free download in Chinese (Simplified) │Spanish.